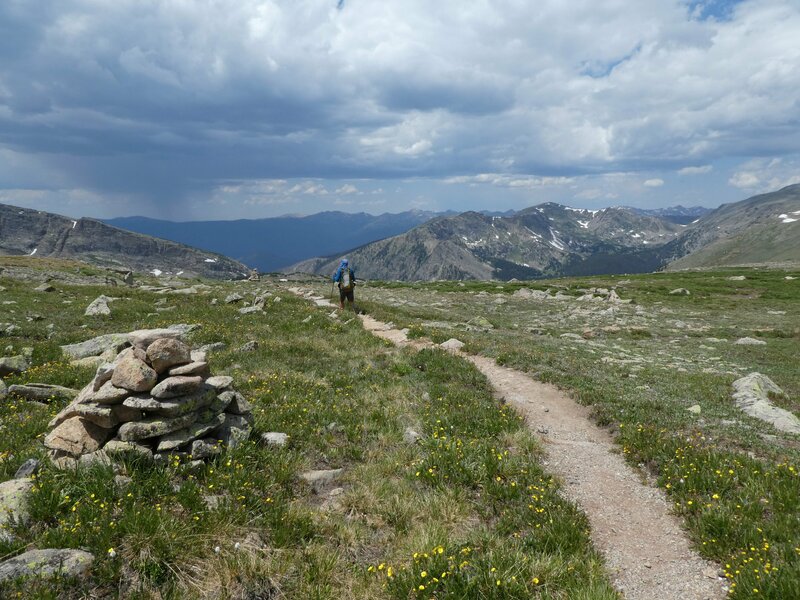 Well the big mountains couldn’t go on forever, and in the last two days we have dropped down from the relatively cool mountains to a warm and muggy 6700 feet above sea level – the lowest we’ve been in weeks. But before we left the mountains behind, we still had a few good stiff climbs over peaks and passes to get done. 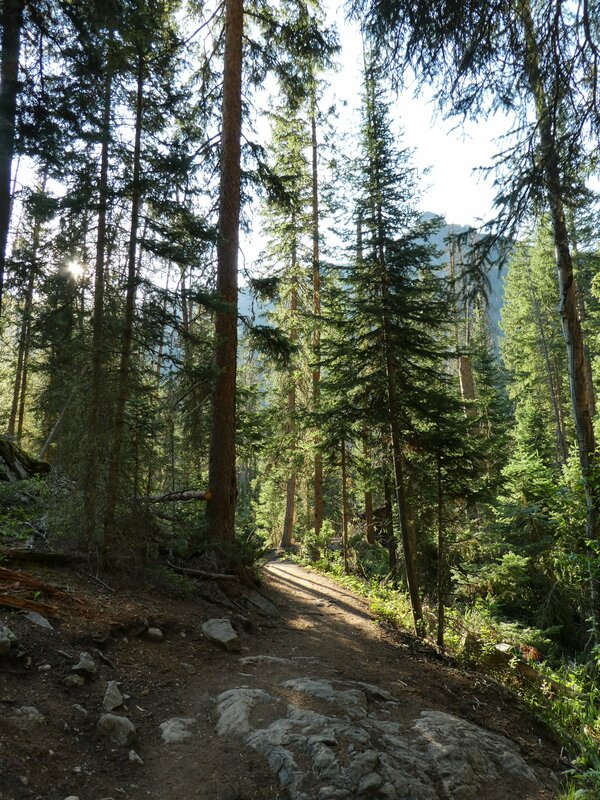 Just north of Grand Lake is the Rocky Mountain National Park, and the Continental Divide Trail makes a loop around the park before continuing northwards. 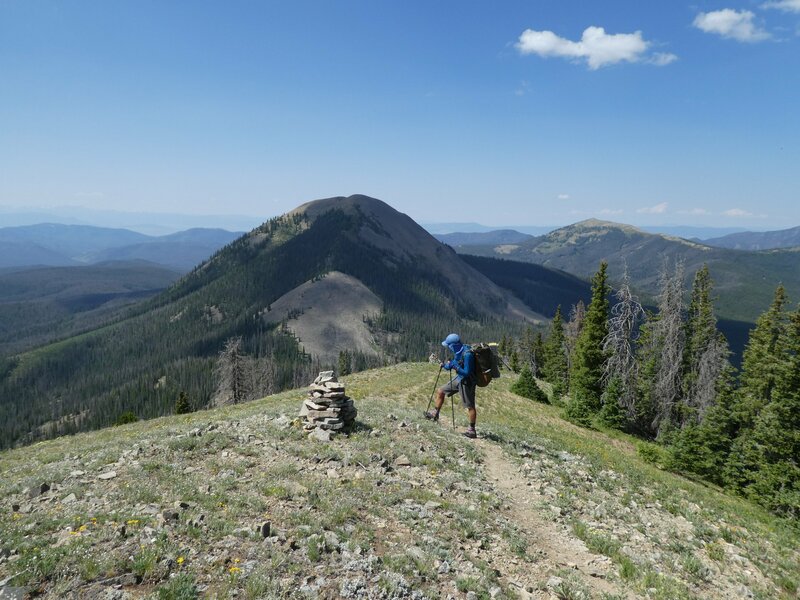 So Neil and I decided we would “slackpack” the loop – leaving most of our gear behind in Grand Lake, taking only what we needed for the day, then having completed the loop collect our gear and head north. It made for a really pleasant day’s hiking – light packs, well maintained trail and some really good scenery meant that the 22 miles just flew by (in spite of an afternoon downpour). We were also really interested to meet a national park ranger, and chat with him about issues facing the park – including an increasing problem with the number of moose. 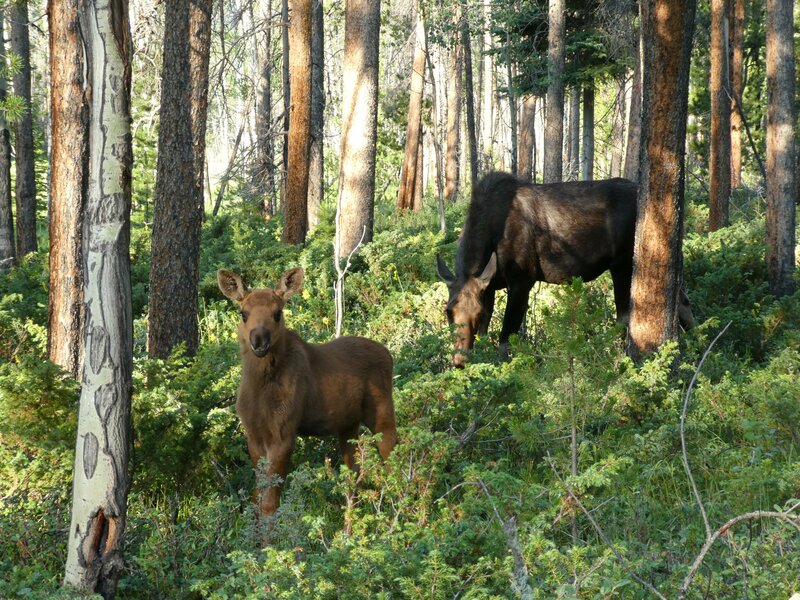 We saw six while we were hiking that day – I took a photo of the first two, but by the time the fourth, fifth and sixth had blocked our path, the novelty had kind of worn off! When we got back to Grand Lake that evening to collect our camping gear, a massive thunderstorm blew in, dampening our enthusiasm for getting back on trail. Luckily for us we bumped into some other hikers who were also looking for accommodation, so we agreed to split a room. We felt really relieved to be inside, in a comfortable air conditioned room while the thunder rattled the windows. 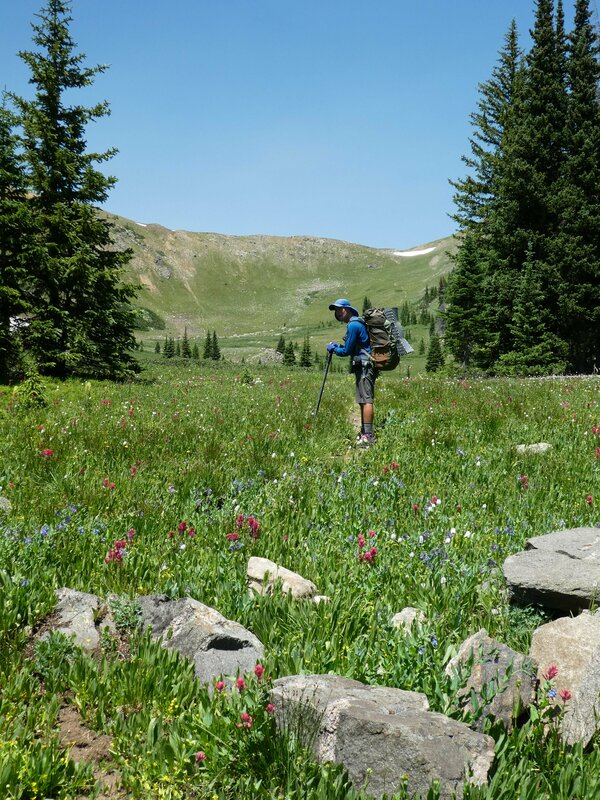 The next morning was bright and sunny as usual, as we set off on a long climb up Bowen Pass, through lush green meadows filled with flowers, before topping out at over 11,000 feet. On the way up we met Minutes, Bartender and Jesus, and when we got to the top we all sprawled in the sunshine. I think it would be fair to say we all felt that the hardest hiking was behind us, for now at least, and there was a sense of being able to take your foot off the accelerator, slow down, and take things easier. 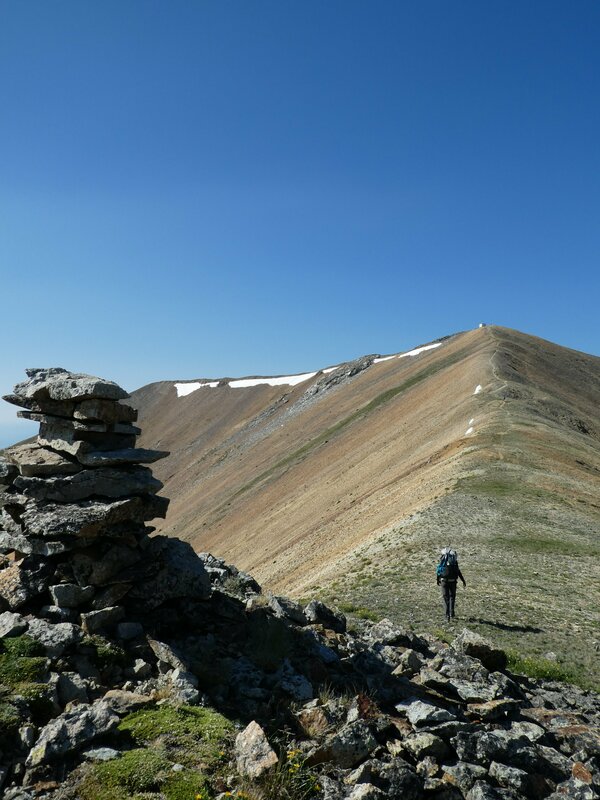 In fact this wasn’t the case, as the trail continued to push us with lots of ascents and descents, and blown down trees to climb over – exhausting work with a heavy pack! 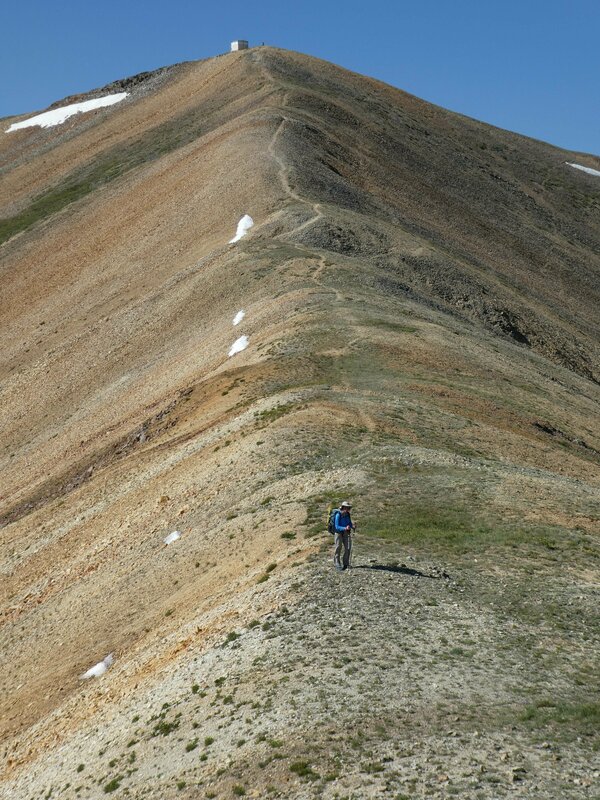 But we did have one final glorious mountain to climb the next day – Parkview Mountain, at 12,300 feet. Once we were out of the trees, the views forward to low mountains and back to the high mountains were beautiful. 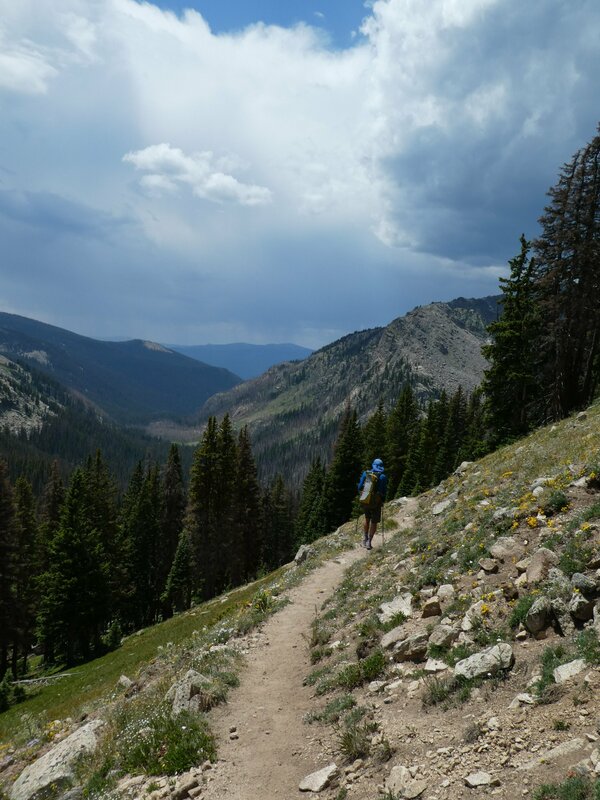 Much of the rest of the day was spent following ridges in and out of the treeline, being chased by thunderstorms, before making camp after 25 surprisingly hard miles. This left just 25 more miles to cover before hitching into the town of Steamboat Springs to resupply – sadly all on roads. A pretty but mosquito-ridden forest service road led to a hot dusty dirt road, before a final ten miles on tarmac as storm clouds rolled in to give us a wetting. We thought our luck was out as we stood by the road for an hour and a half with our thumbs out, willing drivers to stop for us as we were attacked by mosquitoes and blackflies, but finally a builder in his van did stop, and dropped us off at a motel in town. Showers, burgers and beers, another section completed, and now at our last town stop in Colorado. 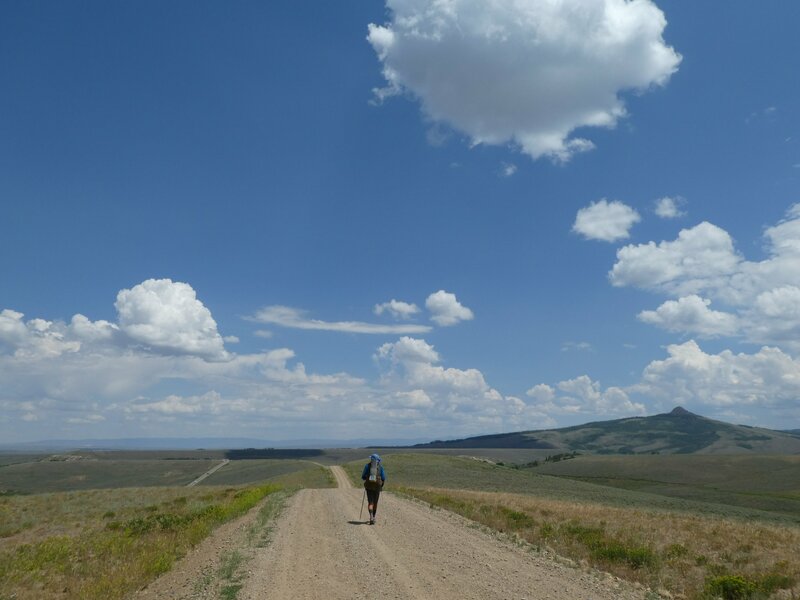 In three days’ time we cross into Wyoming, and we’ll see what challenges that brings for us! Congratulations on the birth of your daughter! That’s great! We can totally understand you wanting to spend more time at home than the trail would allow. Sorry we didn’t manage to catch up with you, if you fancy a short hike later on do get in touch! Planning on finishing in Glacier towards end of September. Do you have a rough ETA into Rawlins and points further north in Wyoming? Hi Collector, should be in Rawlins on 22nd July, staying there for a day or two. Not worked out our schedule yet for beyond that – all depends on how the Divide Basin goes! Hi Jim, thanks for all your support, glad to hear our photos are bringing back good memories! I wouldn’t have fancied spending the night in that observatory either!